The stunning debut for fans of Celia Imrie and Dawn French. Meet the daughters of Iris Parker. Dee, sensitive and big-hearted; Rose, uptight and controlled; and Fleur, the reckless free spirit. At the reading of their mother's will, the three estranged women are aghast to discover that their inheritance comes with very tricky strings attached. If they are to inherit her wealth, they must spend a series of weekends together over the course of a year and carry out their mother's bucket list. But one year doesn't seem like nearly enough time for them to move past the decades-old layers of squabbles and misunderstandings. Can they grow up for once and see that Iris' bucket list was about so much more than money? 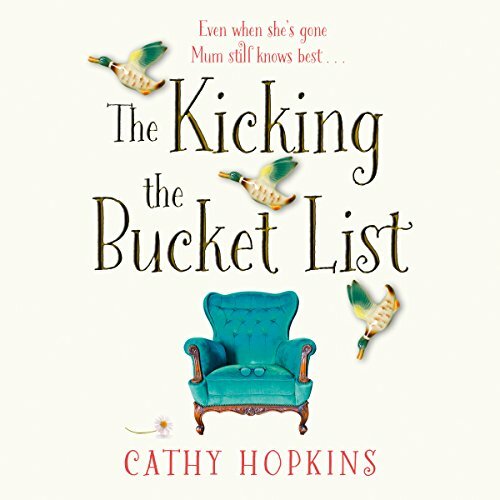 What did you like most about The Kicking the Bucket List? I found it engaging, but as the story moved on I couldn't help wondering if it might be better on the self-help section. It's attention to detail in the loss and grieving process started to disengage my interest as a novel, but could easily see how it would be helpful to others. I can’t bear standard chic lit, full of one cliche after another. I won’t consider any book with cupcakes or Italian sea shores on the cover. I took a chance on this though after a 5*, but particularly tough going book on domestic abuse. I needed something light before returning to my favourite crime fiction genre. This is a tale of mature women, sisters, forced together after their mother’s death. It was a good read/listen. I could have done without the excessive ‘love interest’, but even that was handled differently to the usual chic lit. All in all, recommended. Really beautifully narrated, and the story is very compelling. It describes very gently and beautifully a complex relationship between the three sisters in older age, and gently reminds us things aren't always what they seem in life. Truly heartwarming. I thoroughly enjoyed it. I absolutely loved the way the story unfolded. sisters should never lose touch as the longer it goes on the harder it is to mend. I am so glad they got there in the end. just goes to show Mother knows best and more than you think. It made me look forward to my commute to work so I could listen. A great book and I loved the characters. I got a bit teary at the end but really enjoyed it. This is my first Cathy Hopkins book and I am glad about this choice. This book is like a bible of a sort. It's filled with too much than I can describe. I was immersed fully from the start. I was really matters bed and guided by this story. Thank you Cathy Hopkins for letting the Universe speak through you in the novel. What a year my family and I are experiencing advice write. I will remember this book. I am going to buy the hardcopy version to touch whenever I feel to. Thank you for writing do beautifully and soulfully. I initially thought the book was a bit slow and was going to be just another candidate for a chick flick. However I stick with it and was immensely pleased that I did. Some lovely twists and turns.